Last year I managed to make the worst prediction ever for the world driver's championship. 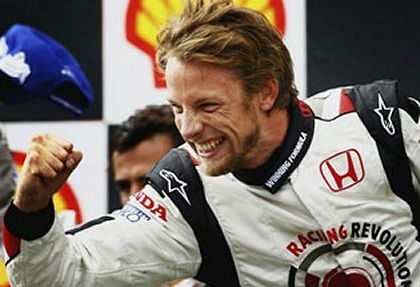 I knew it was sticking my neck out a bit going for Jenson Button but there were promising signs in the improving performance of the Honda, his first win had come at the Hungaroring and, to be honest, I had a feeling that it was this year or never for the Brit. Who could have predicted that Honda would build on the successes of 2006 by producing one of the worst cars in the pack? It was as if the team had put so much effort into its ridiculous new livery that they had forgotten how to design a racing car. Poor Jenson was left with no chance and I had to grin and bear the inevitable wry comments on my prediction. So must it be never for Button? Perhaps not; I would like to think that my feeling on that score was wrong too. Just as in 2006, there are signs that indicate Honda's fortunes may take an upswing in the coming season. Most importantly, they have Ross Brawn on board and that is bound to get the team focused and working more efficiently. Ralf Schumacher's revelation that Toyota were not interested enough in Brawn's services to make a serious effort for him shows Honda's more flexible attitude, another good sign for the future. And surely the embarrassment of their failure this year will galvanize the team into trying that much harder. They couldn't get it that wrong again, could they? There is also the matter of the top two teams to consider. Montezemolo's changes to the structure and personnel at Ferrari will really begin to bite in 2008. This year we saw uncharacteristic mistakes by the team but the car was good enough to compensate for them. I suspect that the Ferrari F2008 will not be as much of a force as its predecessor in spite of claims that the design team remains as strong as it has been. In F1, no team stays at the top forever - the competition is too fierce for that. And the changes at Ferrari have been so far-reaching and extensive that they must have an effect. It is entirely possible that Ferrari will fall back into the chasing pack, although this might be masked by the fact that McLaren does the same. With all the controversies and acrimony of this season to cope with, it is hard to see how McLaren should not be affected on the race track. Consider how carefully the designers have had to work to ensure that there is nothing remotely Ferrari-like on their car. With FIA inspectors peering over thir shoulders, they have had to do their job with other concerns always in mind. It would be no surprise, therefore, if the MP4-23 were to turn out rather less competitive than this year's car. And that would be like McLaren too. They seem to go through good years and bad years, more or less in succession - and it is their turn for a bad one. I am not saying that they will fall away as badly as Ferrari; it is more that they will lose the edge they have had over the competition, allowing other teams in with a realistic chance of winning races. And, if I am right in all this (a debatable point, I know), there is a chance going begging for a new front runner to emerge. We think immediately of BMW, of course, and it is true that they are the most likely to upset the established order. Running ahead of schedule is becoming a habit with them and the goal for 2008 is to win a race - to be ahead of that, they would have to win several. Which must put them in with a shot at the championship and Nick Heidfeld would be a good outside bet for the drivers award. But the German team are not the only ones who might challenge for wins. Renault have done it before but it remains to be seen whether they will even be on the grid next year, judging by the details of the spy case leaked today. Even if Max manages to fudge his way through to let Renault escape the charges, it is not likely that Alonso will be driving for the team and, without him, they seem unable to find the extra speed necessary to stay at the front. A more likely interloper is Red Bull, with a year's experience of working with a Newey design behind them and maybe even the fabled six tenths from Alonso to assist. We tend to think their day must come later, after a year or two more perhaps, but it can and does happen that a team makes an unexpected breakthrough to become a contender. Williams did exactly that with the FW07 in 1980 and Red Bull must be one to watch, therefore. Talking of Williams, there is always an outside chance that they could come through, especially with the talent of Nico Rosberg in the driving seat. But I think the budget will hold them back from complete success - I can see a win or two but not the whole championship. Of the rest, the only one that could surprise us is Honda. If it is possible to get a design wrong, it is also possible to get it right and that would be all that is needed to propel them to the front of the grid. They have the talents of Brawn now and a pair of drivers who are still capable of winning. It might be thought that Barrichello is past his best but that ignores the fact that he did better with the car than Button in the early races of 2007. You have to look at why Honda made such an appalling mess. Had it been a simple design idea that had gone wrong you could argue that they would have learned from that and are unlikely make that mistake again. However their problems were a badly calibrated wind tunnel. No correlation between tunnel, CFD and track. No proper system of continual assessment of the results from these three areas. Given the time take to identify the problems with the wind tunnel and then to (hopefully) sort it out it is extremely unlikely that they will produce anything more than a competent car for 2008. Red Bull on the other hand have had nearly two years of Adrian Newey's input and a year's experience running his car. Now Geoff Willis has been added to the mix to sort out reliability amongst other things. They could be a good outside bet for race wins in 2008. I was presuming that they had indeed learned from their mistakes, Steven, and had fixed the problems during the course of the year. That would be too late to do anything about the present car but should put them back on course in designing next year's offering. It's worth a flutter, especially with Brawn in charge. And I agree about Red Bull - we expected too much of them too quickly this year but they should begin to deliver from now on. Honda and Red Bull are looking good, but I get a general queasy feeling that neither Coulthard nor Barrichello have the same fire they once had during their McLaren and Ferrari days. So I would still go with Ferrari as both their drivers are in good shape with a fast car, settled well with the team and crew, and are not interested in Alonso style politicking. All this is change, if one Mr. Schumacher decides to return from retirement. Barrichello and Coulthard are probably just good number two drivers these days, I agree, Bharath. But I think Ferrari will go downhill from now on and things will not be so easy for their drivers next year. If Schumacher were to return, would it be with Ferrari? I doubt it, now that his team has been broken up. And I really can't see him driving for anyone else. He'll stay in retirement, taking the odd test drive just to have fun. I agree with you Clive and I feel Honda will be back soon enough. They remain a strong team and Ross Brawn will make them more focussed. Quite simply, Honda built a lemon this year but it doesn't mean their next car has to be like that as well. McLaren produced a dud in 2004 but bounced back in 2005 with the quickest car of them all. In the end it is just a shame tha Honda wasted so much progress in 2007 becasue they should have had the season that BMW ended up having. Absolutely, Marty - 2007 was a wasted year for Honda. But that shouldn't allow us to write them off for next season. Anything is possible! Amazingly, Ross Brawn says he is being paid according to results. If that is so, I reckon it won't be long before everything is sorted out and everyone on the same page! I know the car has been designed already but it may have benefited from the lessons of 2007, who knows? Hope springs eternal in the Jenson fan! I had high hopes for BMW this year, and then Clive made his prediction for Hiedfeld...... Oh well. As for Honda, I think the lack of TC should be another 'ace up the sleeve' for Jenson. If anyone can take advantage of it, its him.